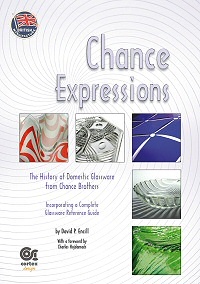 Two books were currently planned for the 'Chance' series, but due to the influx of extra data on the domestic glassware, this prompted a supplemental volume called Chance Additions. A new book, just launched in May 2009, which charts the history of glassmaking in London. A very detailed book with hundreds of photos and illustrations. A new book, which explores the efforts by Chance Brothers from 1851 to produce lighthouse parts that were eventually found all around the world. 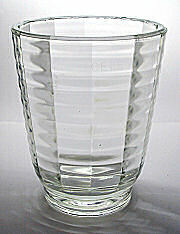 Using technologies pioneered by James Timmins Chance, this optical glass became world-renowned. A new book, which is a supplement to Chance Expressions, and not a replacement. An example of the Koala design! This is just a small representation of what is available. 122 pages with over 650 photographs and images - over five per page. From a collectors point of view there is very little to help with the identification, dating, valuation and relative rarity of domestic glassware produced by Chance Brothers, apart from this web site. But there are many misleading comments and statements that simpy propogate rumours and incorrect identification for some of the patterns – all these	are addressed in Chance Expressions. Available soon. Is your rare Swirl dish really Swirl? Who designed Swirl? Probably not who you think! Who designed the superb Psychedelic pattern? Handkerchief Vases: how many colours/patterns? Which rare patterns are not listed on this site??? How much did Britannia cost in 1950? Included is a chapter précising the history of Chance Brothers	— Volume 2 (Chance Reflections, due out in 2008) deals with this	in	depth,	along	with the various technologies developed by	the company. Also included is a chapter detailing	Chance's involvement with the media and the influence	of 1950s	design, through	the various manufacturers, organisations and	exhibitions.